Those new to the delicious world of sushi usually start with California rolls or Alaska rolls. Some people will be even too hesitant to try anything with raw fish, and can be tempted into the world of sushi with tempura yam or futomaki rolls. But once you get a taste of the freshness of sushi, it usually does not take long for newcomers to want to taste sashimi. The most adventurous cannot help but to try something new like eel or delicious octopus. That’s been my experience with how people are introduced to sushi, but yours may vary. We’d love to hear if you were adventurous to try a more “exotic dish” your first time! 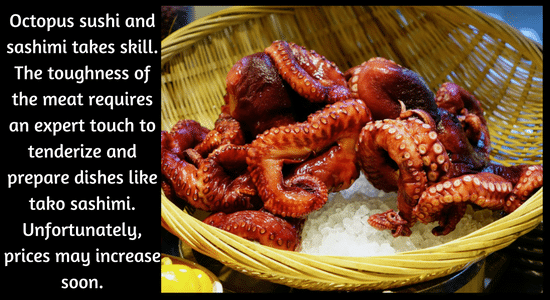 If you enjoy octopus sushi, you know that it takes time and skill to prepare octopus for sushi. Octopus sashimi is a dish that takes expert level skill to cut the meat thin enough to be a pleasant experience to eat. Octopus sashimi is generally roughly around the same price as Sockeye Salmon or Toro sashimi (at least in Vancouver BC). But that might be changing soon. You can expect prices to start going up. Why? Supply and demand. More people are enjoying octopus sushi and sashimi, and there is less of it in the world. I’ve been keeping an eye on sushi grade octopus prices. So far, there has not been an increase. It’s very possible that the price could go up in the near future if the shortage continues. When you hear reports that some restaurants are having their orders cancelled, you get worried. This is not the first time that octopus demand has outstripped the supply. In 2011, poor catch in Africa lead to a shortage. Shortages seem to be cyclical for tako, as octopus procreate in such large amounts – as long as temperatures are warm and there is plenty of prey. Japan is known to have the best seafood and fresh sushi in the entire world. The huge demand for octopus in Japan combined with the falling value of the yen is hurting Japanese sushi lovers the most. Have you seen octopus prices rising, or it being taken off the menu at your favorite sushi restaurant? Please let us know in a comment below.